Your Friends of WFPL membership card and your library card are your tickets to an exciting adventure! Join us for great deals at our bargain book sales, special programs, and creative learning events, and much more. Shop and give. It's just that simple. And we all WIN! Just go to Amazon Smile using the link below, choose Friends of the Pensacola Public Library, and voila... a donation is made to the Friends. You can also purchase books from the Library's wishlist. Going green is simple. Recycle your new and used books, CDs, DVDs, and magazines by donating them to the Friends of WFPL. 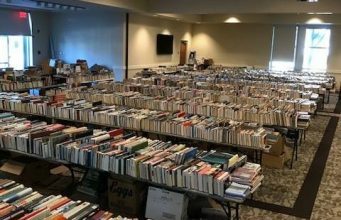 Through our book sale and other outlets, we'll find them a good home and help raise money at the same time. Want to join our mail list? It's free and easy! Don't worry, we won't overload your inbox. Friends of WFPL generally send out a quarterly newsletter and details on upcoming special programs and events.